Meet everyone's favourite DreamWorks characters in the heart of South Bank. Shrek’s Adventure! London is the capital’s newest family attraction, located within the iconic County Hall neighbouring SEA LIFE London Aquarium, The London Dungeon and The Coca Cola London Eye. Shrek and Princess Fiona, Donkey, Puss in Boots and the whole of the inhabitants of Far Far Away arrive in Old Blighty for a spot of London sightseeing – but things don’t go to plan and you’re taken on a madcap adventure. DreamWorks Tours, Shrek’s Adventure! 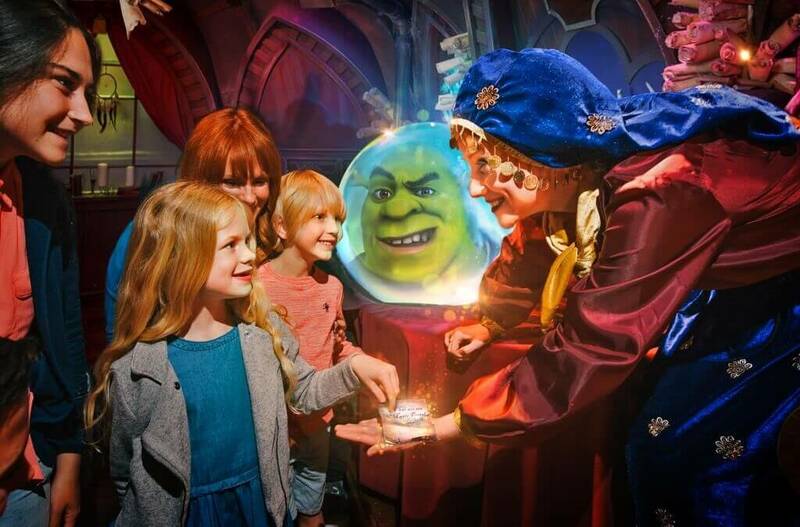 opens its departure gate for a special adults-only after hours tour to Far Faaaaaaaar Away with Shrek’s Adventure London Lates – a brilliantly bonkers adventure of mayhem, perfect for a postwork jolly with your mates. Book online to save up to 30%. Majority of facilities are designed to be fully accessible to disabled guests, however it may not be possible for all guests to access the magical 4D bus experience. It is also important that any wheelchair users or guests with special requirements book with THE Merlin Contact Centre (+44) 0871 221 2837* or (+44) 0333 321 2001. It took over two years to bring to life the hilarious fantasy world of Shrek and Far Far Away, including more than 100 builders from 20 different trades, plus animators, designers, engineers, artists, script writers, theatre directors and costume designers! Shrek's favourite drink is an Eyeball Martini whilst Donkey's biggest fear is wooden bridges. This OGRE SIZED experience lasts for approximately 75 minutes. Whilst there’s no age limit, we recommend Shrek's Adventure! London for children aged 6-12 (and for those younger knights and princesses feeling especially brave). Discover this new gallery gem in Oxo Tower Wharf. Take a stroll along South Bank's leafy riverside. The Riverside Walkway is open 24 hours a day. The Riverside Walkway is fully accessible. Close by stations include Blackfriars and Waterloo. Take a leisurely stroll along the banks of the Thames as it winds through the capital. Soak up the South Bank atmosphere, London's home of art, culture and unique architecture. Cross the bridges for circular walks with spectacular views. The Riverside Walkway attracts visitors from all over the world and is also a valuable resource enjoyed by all who live or work in the area. It is also used as a venue for unusual and unique events - keep your eyes peeled for exciting pop-ups. A new dining destination located behind the National Theatre. Please note, the kitchen opens at 12pm on Sundays. The Green Room is a contemporary restaurant, bar and garden developed by local social enterprise Coin Street Community Builders in collaboration with the National Theatre. Serving delicious, ethically-sourced British diner food and roast dinners on Sundays, it’s a unique temporary architectural experiment which offers an airy, contemporary space featuring props and scenery recycled from National Theatre shows. [email protected] showcases a varied programme of photography, contemporary design, architecture and issue-based exhibitions. The No.1 sightseeing tour on the Thames - choose from afternoon tea, sundowner and even Elvis cruises. Stylish river fleet, running every 20 minutes between key London piers. Jubilee Gardens is a beautifully landscaped park situated in the heart of South Bank, behind the London Eye. South Bank's premier steak restaurant and cocktail bar. The bar is open until midnight daily. If you're headed to Gillray's, bring an empty stomach and high expectations. Situated in full view of Parliament, the seat of British democratic administration, Gillray's fine food is as remarkable as its surroundings. Everything about Gillray's is a seeming nod to British culture and heritage. Their meat is sourced from British farms. Their bar boasts not only fantastic staff but over 100 types of gin. Their service is of the highest quality in the British sense - subtle, yet polished. Even their decor is reflective of the old-world grandeur of the Houses of Parliament. During afternoon tea, a tray is neatly delivered to your table and drinks are filled (or refilled) in a smooth, near unnoticeable ballet of table service. Their bar is open late and serves a mixture of classic and contemporary cocktails, a wide selection of beers, wines, and spirits. Kitchen is National Theatre's all-day cafe. Kitchen is the National Theatre's all-day café - it's the perfect pit stop for lunch with friends, tea and cake or a pre-show light bite. The contemporary cafe serves up a range of freshly cooked meals - with a menu that changes daily, but affordable examples include tuna provencale linguine and steak and ale pie. Alternatively choose a baked treat from the giant cake table which you can't miss in the centre of the cafe. With it's location directly opposite the river, enjoy the large outdoor eating areas in warmer months. Seductive and striking, Sea Containers London brings a bold new energy to London's South Bank, blending the style and sophistication of the boutique brand with South Bank’s artistic vibe. The internationally-renowned venue presents new writing, classics, comedies and musicals. A four-screen cinema venue showing a huge selection of classic and contemporary films. IWM London tells the stories of those whose lives have been shaped by war through the depth, breadth and impact of their Galleries, displays and events. Pret A Manger, or 'ready to eat' is a hugely successful UK brand of cafes, renowned for its organic and fresh produce. Pret creates handmade natural food avoiding the obscure chemical, additives and preservatives common to so much of the 'prepared' and 'fast' food on the market. Pret operates a bit like a restaurant. They build kitchens in (or very near) every shop. They also offer their unsold food to charity at the end of each day rather than keeping it to sell the next day.